California Department of Public Health does not regulate sports bottles or outdoor recreation water filters, such as backpacking or camping water filters. California law limits CDPH's authority for regulating water treatment devices to those that are intended for residential use and make health claims. All the water filters on this site are sports bottles or outdoor recreation water filters, backpacking or camping water filters. 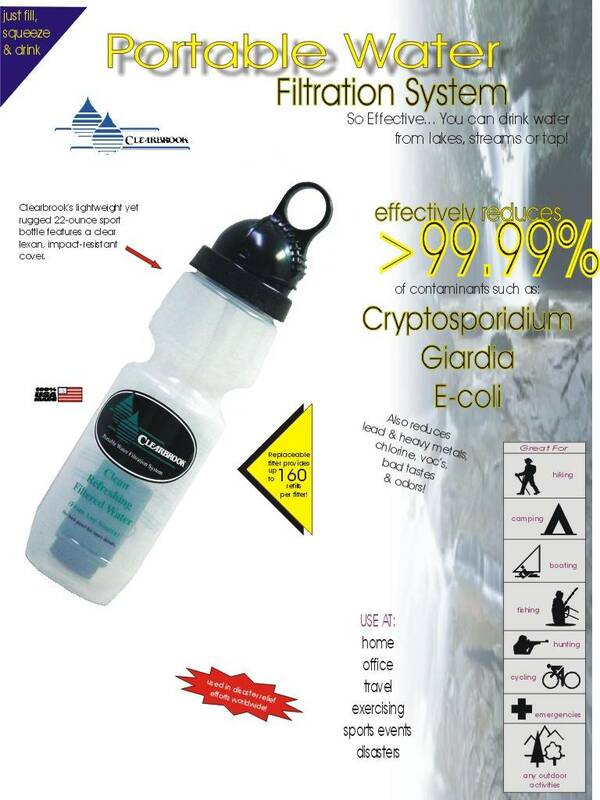 Our water filters are not intended for residential use and we do not make any health claims. If your state restricts or regulates water filter sales, making it illegal for us to sell or you to buy water filters, do not buy the products. Call us for a refund. This is the law that we would have to follow in order to ship a water filter to Iowa. more contaminants in drinking water. not required to comply with these rules. subsequent to the initial registration. �ANSI� means the American National Standards Institute, 25 W 43rd Street, New York, NY 10036. �Buyer� means the person to whom a water treatment system is being sold, leased, or rented. 12th Street, Des Moines, Iowa, 50319-0075. �Drinking water� means water intended for human consumption. removed with a purposeful effort by the owner. section 714.16 and that meets the requirements of 641-14.7(714). contaminant level, as specified in the national primary drinking water regulations (40CFR141). tests and certifies water treatment systems. a water treatment system requires service, typically after a fixed time or volume of water. �Seller� means the person offering a water treatment system for sale, lease, or rent. Oakdale Campus, Iowa City, Iowa, 52242.
concentration of one or more contaminants. performance testing facilities and data. separate models unless the manufacturer can demonstrate that they are identical products. will be considered to be separate models. performance testing, the provisions of 14.4(3) shall apply. from Table 1 or in accordance with a protocol approved by the state hygienic laboratory. Table 1 or methods approved by the state hygienic laboratory. submit an alternate performance testing protocol for the water treatment system to the department. address of the manufacturer�s representative. 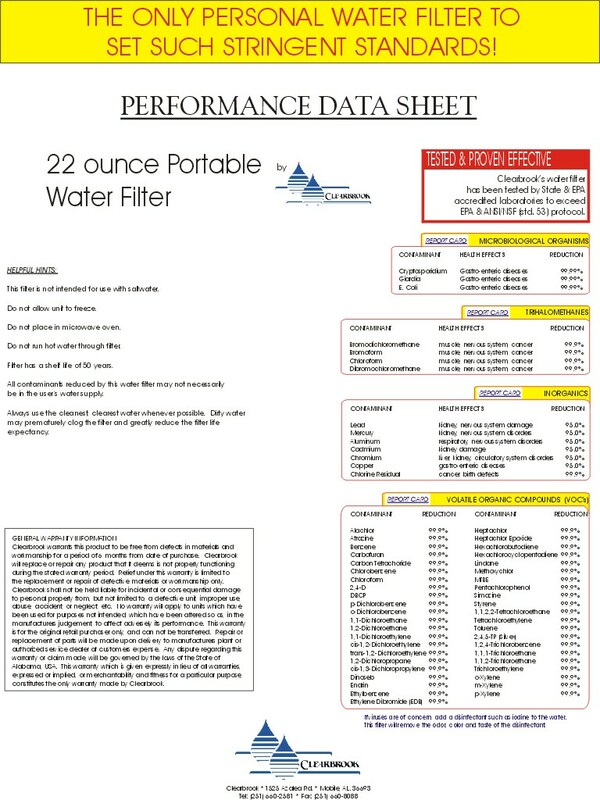 performance of other water treatment systems. any chemical added to the drinking water by the water treatment system. (6) A list of the contaminants claimed to be reduced by the water treatment system. water that is microbiologically unsafe as defined in NSF/ANSI standard 53. 1. A schematic of the test rig with specifications for the critical components and instrumentation. 3. Details of how the general test water and the challenge water are prepared. 4. Water pressure, flow rate and temperature during the test. 5. Sample schedule for influent and effluent water. 6. Analytical methods for the challenge parameter(s). 7. Performance standard for the challenge parameter(s). b. The performance testing protocol shall include the following provisions. (1) At least two units shall be tested. (2) The flow rate and water pressure shall be typical of the end use for the water treatment system. of the capacity listed on the PDS. method in the applicable standard in Table 1.
conditions on the approval or the reasons for disapproval shall be in the report. performance testing protocol review done in accordance with these rules. facilities and data are found to be adequate when audited by a third-party testing agency. (1) A detailed description of the manufacturer�s testing facilities and equipment. (4) An evaluation of the manufacturer�s laboratory quality assurance program. with the approved performance testing protocol. contaminant claims shall be reported in accordance with 14.6(3). a. The name, address, and telephone number of the agency representative. d. Written verification to the department that the agency has the capability to perform the U.S.
agency will do performance testing. e. A copy of the agency laboratory quality assurance plan. f. A detailed description of the agency�s testing facilities and equipment. used as the basis for testing and the contaminants for which testing was done. test of a water treatment system prepared for a client, if applicable. j. A $200 review fee. parameters tested by the agency. (2) The ANSI accreditation certificate for each applicable standard. (b) Model number of the water treatment system. (d) Rated capacity, if applicable. (e) Service flow rate, if applicable. (f) Daily production rate, if applicable. (g) List of the contaminants for which the water treatment system has been tested. a. The information required by 14.5(1). testing of a water treatment system. submitted by an agency applying for third-party testing agency status. (1) The independence of the agency ownership and management. (2) The adequacy of the agency�s facilities and equipment for water treatment system testing. responsible for testing water treatment systems. which the agency will do performance testing. (5) The adequacy of quality assurance systems at the testing facility. and shall be provided to the agency representative. a. The testing facilities are relocated. b. The corporate identity of the agency changes. or audited a manufacturer for a period of three years or longer. sold, leased or rented and before it is advertised for sale, lease or rent in Iowa. for performance in accordance with a standard in Table 1. (7) Copies of the labels for the water treatment system and for any replaceable components. (8) Copies of product packaging, product promotional materials, and sales training materials. (10) A nonrefundable initial registration fee of $800 for each water treatment system. b. A registration issued between July 1 and March 30, inclusive, shall expire on the next June 30.
after the year in which the registration is issued. on or before May 31 of each calendar year. system was tested during the initial registration process. explained and supported by third-party testing results. c. A list of all of the trade names the system is sold under. d. A nonrefundable annual registration fee of $400 for each water treatment system. maximum of $200 for each water treatment system. (1) A description of the changes in claims, capacity, or components. treatment component from the testing agency is sufficient. (3) A revised PDS that meets the requirements of 14.7(2). (1) The original model number(s) and trade name(s) of the water treatment system. (2) The changed or added model number(s) and trade name(s) for the water treatment system. the changed or added trade names. "IMPORTANT NOTICE - Read the manufacturer's performance data sheet." a. The name, address, and telephone number of the seller. (1) The list of contaminants found to be reduced by the water treatment system. (2) The average test influent concentration level of each contaminant or surrogate. concentration, effluent concentration, and percent reduction for the contaminant. (5) The MCL for each contaminant. PDS, but the substances may not be referred to as contaminants. temperature limitations; maintenance requirements; and expected replacement frequencies. (3) The seller's warranty limitations. consumer information pamphlet may be printed in detail by the manufacturer. be sold in Iowa unless it is first registered with the department. b. A copy of the consumer information pamphlet. PDS. The seller shall retain the signed PDS on file at his place of business for at least two years. contaminant removal capability of a water treatment system. approved or endorsed by any agency of the state. by reference to the appropriate subsection of Iowa Code section 22.7.
of these rules shall be subject to civil penalties pursuant to the authority of Iowa Code chapter 714. Overnight shipping may not be available to your area.